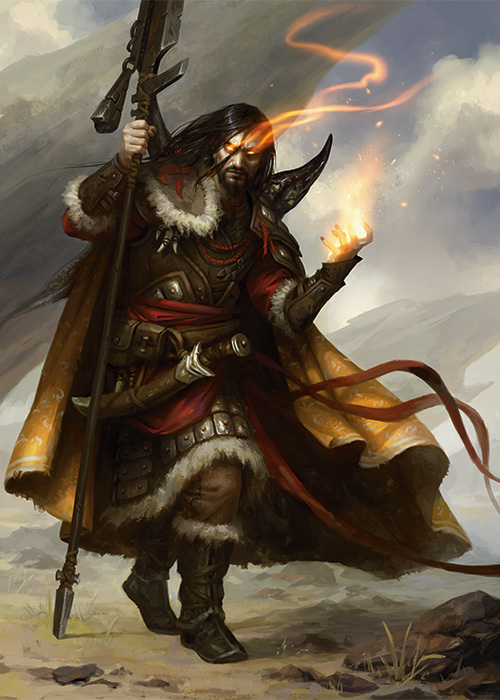 Sarkhan Vol has arrived in Tarkir's past, more than a thousand years before his birth. When he first arrived, he saw the plane's long-extinct dragons for the first time, watching them emerge from a crackling storm. Then he saw her: a human woman fighting with a glowing dragon's claw on her staff and a sabertooth cat at her side. She killed a dragon broodling with powerful magic and drove the others away. She is everything he hoped for when he yearned for Tarkir's dragons. He has to know more. Snow crunched under Sarkhan Vol's boots. He and his guide were moving higher. The cold mountain air seared his lungs, and he savored the feeling, like breathing dragonfire in reverse. She might not know she was guiding him, but she'd certainly made herself easy for him to follow. Every mile or two, she'd found or cleared some bare patch of stone and gouged two sweeping curves into it with the clawed staff she carried. When he first saw it he had thought she was marking the place where she had defeated a dragon. Now, as the trail grew longer, he was not sure what to think. Perhaps she was Ugin's herald, leading him onward. Perhaps these signs really were meant for his eyes. Yet they meant nothing to him. Each was the same. With wiser eyes he might see…but he did not dare take dragon form where she might see him, not if he wanted any hope of speaking to her. This patch was still warm, the marks glowing with the red heat of her staff. He was catching up with her. 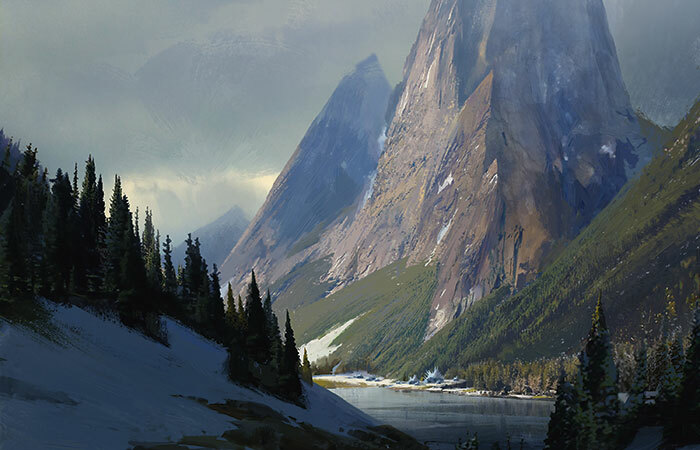 She was Temur, native to these mountains. He was Mardu, out of place and time. She wanted him to catch up with her. There was a whistle, like a bird's, behind him. He got no more warning than that. Something slammed into him from behind, huge and living and warm. He sprawled face down in the frigid snow, pinned beneath what felt like one enormous paw. Huge fangs and hot breath pressed against his neck. He did not struggle. Another whistle, different. The fangs lifted, but the weight on his back still held him immobile. He could not see what held him, but he suspected. Snow crunched, heavy boots tracing a wide semicircle around him, until at last she came into view. She was older than he—far older, some inane part of him whispered—built compactly, with a stern but unlined face. The claw at the tip of her staff glowed red, and her eyes were cold and appraising. Dragon's claw, dragon's eyes. "You're following me," she said. Her voice was rich and vibrant. "You left a trail to be followed," he said. His voice came in choked gasps, crushed beneath who knew how many pounds of sabertooth cat. He gestured weakly to the mark she had made. "You left signs." "Not for your eyes, vagrant," she said. Her tone was unhurried, but she glanced frequently at the sky. "You're following me," she said again. "Why?" Cold snow, cold eyes, hot breath. He considered his answer for as long as he dared. "I am following a…voice, the whispers of a spirit," he said. He hesitated, then: "I seek the great dragon Ugin. I think…I think this might be a vision, and you my spirit guide." "I think you might be out of your mind," she said. "I may be," said Sarkhan. "Time will tell." The woman whistled, and the weight lifted off of Sarkhan's back. Had his seeming madness moved her? Or his mention of Ugin? He crawled toward his staff on his knees, like a beggar. 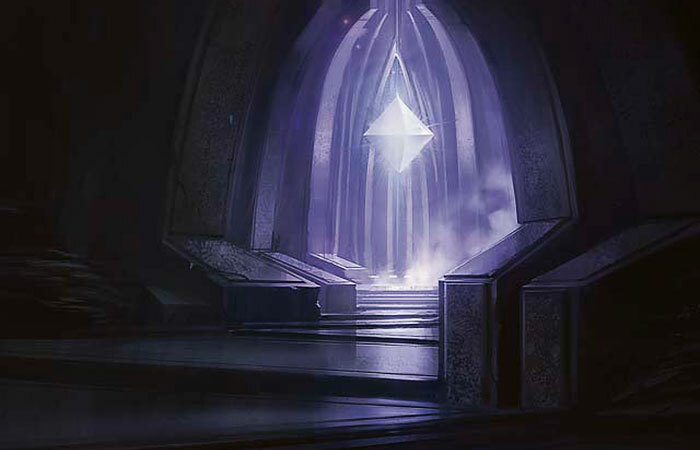 The hedron shard he had taken from the Eye of Ugin was still securely tied to it. It had fallen across the woman's mysterious mark, and for a moment, when he moved it, he thought he saw both of them shimmer. Leaning on his staff, he stood. She was shorter than him. He might even have called her small. But with that sabertooth cat curled around her, with a clawed staff glowing with fiery magic, with those deadly dragon eyes, she looked anything but. "My name is Sarkhan Vol," he said. He saw her eyes take in his strange clothes and wild hair. The claw on her staff began to glow red. Sar-khan, great khan. High khan, sky-khan. To anyone else on Tarkir, it was an absurd claim on anyone's part, most of all coming from an anonymous wanderer. He should have known better, but he'd forgotten himself. In his own mind, it was his name. The voice in his head called him Sarkhan, before it fell silent. But Bolas called him Vol. "Sar-khan," she said flatly. She bowed with a flourish, but there was iron in her voice. "In that case, Yasova Dragonclaw of the Temur pays her respects to you, O khan of khans, and bids you welcome to her lands." Dragonclaw! Even in his own Tarkir, was that not the title of the Temur khan? "And over what," she asked, pronouncing every word carefully, "do you claim dominion?" He had dealt with khans before. With Zurgo. With Bolas. No khan, even a friend, could tolerate disrespect. They knew only one language, the honeyed tongue of flattery, and in his time as Bolas's thrall he had learned to speak it well. Vol is ever your servant, said a voice in his head. It was his voice, pathetic, squirming in the silence of his mind. It awakened a memory, an echo of himself that answered a khan's question. "No one and nothing," he said hurriedly, averting his eyes and bowing. "It is a nickname, given to me in jest, to mock my arrogance. I took it for my own." "And your khan tolerates this?" "I have no khan," he said. "I have traveled far from my home." "An exile," said the woman, with contempt. "No wonder you're dressed in castoffs." She lowered her staff at him. The claw's glow intensified. "You follow me," she said. "You insult me. And you trespass in my lands. Give me a reason to spare you, Vol, or I'll kill you and be on my way." "Please, forgive my rudeness," he said. "As I said, I have traveled far, and even the mighty khan of the Temur is known to me only by reputation. Clearly, you're not here to guide me. Perhaps instead I am here to serve you. You are a khan. I am nothing, a beggar…"
She regarded him for a long moment, then shrugged and lifted her staff. "Enough," she said, with obvious disgust. "Get up." He stood back up, brushing snow off of his clothes. "Thank you, khan," she corrected. "Your delusions are forgiven, but I'll tolerate no further disrespect." "My thanks, khan," he said, a small rebellion. "And my apologies." The sound of his own voice was thick in his ears, cloying. She acknowledged him with a nod. "I am Yasova Dragonclaw," she said. "Khan of the Temur Frontier, dragon slayer many times over, and lord of these lands." She swept her arms wide. "Vol, exile, khan of nothing and no one…welcome." He looked around the mountain, seeing it with new eyes. Yes, these were Temur lands. Not far from where he'd been when he…when time fractured. There was less snow than he remembered, more bare and steaming rock. He turned back to see that she was already walking away, her back turned. He hurried to follow, but a snarl from behind him stopped him where he stood. The enormous cat's carrion breath washed over him. "Follow me, if you're certain that's your path," said Yasova, without turning. "But I wouldn't walk too close. Anchin is very protective, and he won't be gentle with you a second time." They walked in silence, for a time. Sarkhan struggled to follow—but not too closely—as Yasova scrambled over the rough terrain at full speed, his breath coming in steaming gasps. She led him up the sides of a high ridge lined with stout trees. Behind him, the sabertooth padded along, just loudly enough that he could hear it. Yasova stopped on a wide ledge. Sarkhan kept a respectful distance, mindful of the great cat behind him. He breathed heavily. Yasova, seemingly unaffected by the climb, ignored his wheezing. The dragon claw atop her staff began to glow again, and Sarkhan feared for a moment she was going to kill him after all. But she brought the staff's red-hot head down, sweeping it across the snowy surface of the ledge. 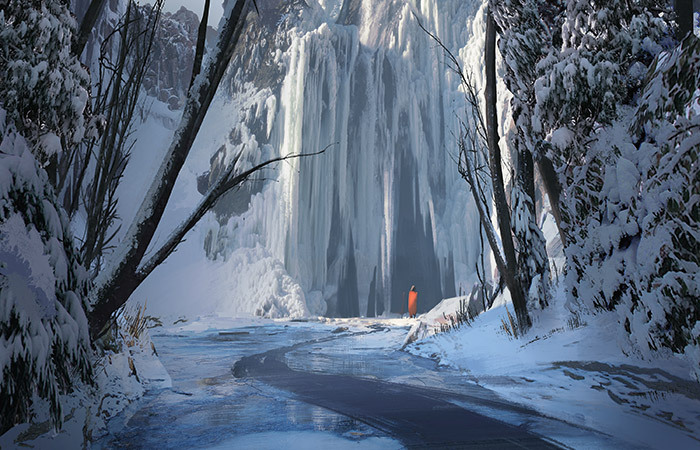 The snow hissed and melted, rivulets of steaming water running down the hillside, until bare rock revealed itself. She reversed the staff and made that mark again—two long, sweeping curves, symmetrical, carved in stone. Sarkhan waited until she was finished. "What is that symbol?" he asked. "Why do you keep making it?" Yasova turned. Her eyes were reptilian, cold and hot all at once. "No questions, Vol," she said. In her mouth, his birth name was a curse. "Not until you've told me about these whispers you're following." Why was she indulging him? What use to her could a madman's ravings be? "I was in…." He faltered, unsure how to translate his history into words she could accept. "I was in a distant place, far from my home and far from here. I visited a cavern called the Eye of Ugin—"
"Where?" she asked, sharply. So the name did mean something to her. "As I said, it is very distant. Across an…"—ocean, he almost said, before remembering he had learned that word on another world. "Across a vast lake, so wide you cannot see from one shore to the other." "There is no such lake." "Even so," he said, "I have crossed it." "After visiting the Eye, I heard Ugin himself, speaking to me. He drew me to this place. But then…everything changed. Ugin's voice fell silent, and I found myself alone, with no whispers to guide me. I mistook you for a herald of Ugin." Yasova looked out over the valley, her back to him. "May I ask you something, Yasova khan?" said Sarkhan. "That storm, that birthed the dragons…what was that?" She turned and stared at him, mouth agape. "Forgive my ignorance, khan," he said. "In my homeland, we do not have such things." "Then where do the dragons come from?" she asked. He thought a long time before answering. "In my homeland, we have no dragons." "Vast lakes and empty skies," said Yasova, her eyes narrowing. "You really are mad." "I know how it sounds," he said. "But there are no such storms, none of these…"
"Dragon tempests," she said, as though to a child. "The source of all dragons. How can you not know this? Where are you from?" Doubts swirled like phantoms. Ugin's voice was silent, his thoughts were his own, and yet he felt less clarity than ever. Was he mad? Had he dreamed all this? Was he dreaming now? 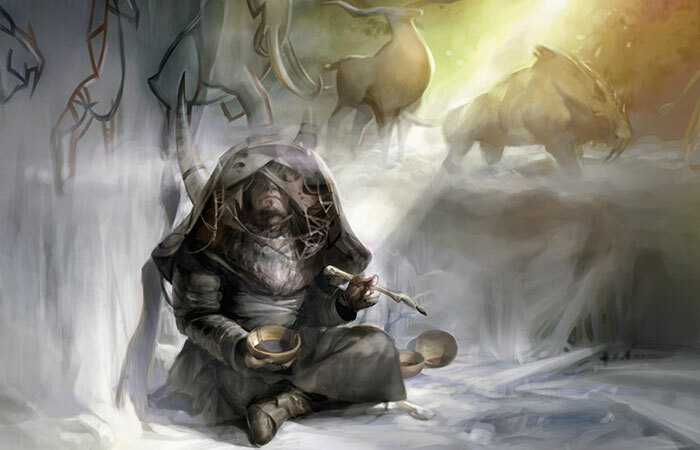 "I knew a Temur shaman once," he said, "who taught me a great deal about the spirits of dragons." "You know the Temur, but you do not know their khan? Are there Temur in this distant home of yours, too?" "I beg your indulgence," he said. He tried to remember if he had ever said exactly those words to Bolas. "My story may seem nonsensical, but it is the only story I have to tell. Consider it a mere vision, a fever dream, if it aids your patience." She nodded at him to go on. "This shaman and his cohort showed me many things. I heard the low, steady voice of an ancient dragon, long dead, whose spirit yet lingered. I would hear that voice again, years later, when I came to the Eye. The Eye of Ugin, my khan. The voice of Ugin." "Ugin lives," she said flatly. The sabertooth, roused by her tone, took its place behind her. He backed away, arms wide, palms out. "My khan," he said. "It's all very confusing to me, but…my home, my life…I believe they are not yet written." The unwritten now, the Temur conception of things yet to come. Shrouded by the now, all around it, circling it like beasts, were the possible futures of the unwritten. "Nothing lives in the unwritten," she said. "It's not a place. I don't know what this shaman told you, but it simply doesn't work like that." "Then perhaps I had it backwards," he said. "Perhaps I am your spirit guide—a phantom of the unwritten, here to tell you of one possible path from this now to the next. Ask. I will tell you anything." She advanced on him, her staff crackling to life. "This place you speak of, your supposed home," she said. "It's this place, isn't it? 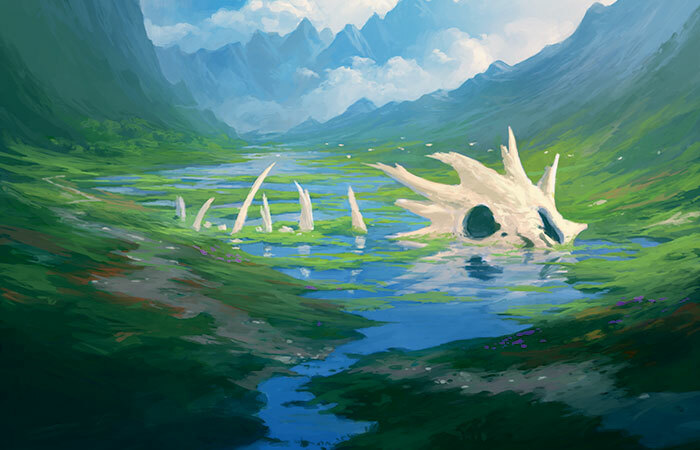 Tarkir, but beyond the now?" "Yes," he said. "I was Mardu, once, and I traveled among the Temur. But my khan's name, and that Temur khan's, would not be known to you. They are not yet born." "And there are no dragons?" she asked. Her eyes gleamed eagerly. "Not one?" "Not in all of Tarkir," he said. "Only bones." "Long dead," he said. "Only whispers remain. The whispers that brought me here." "Then it's true," she said. 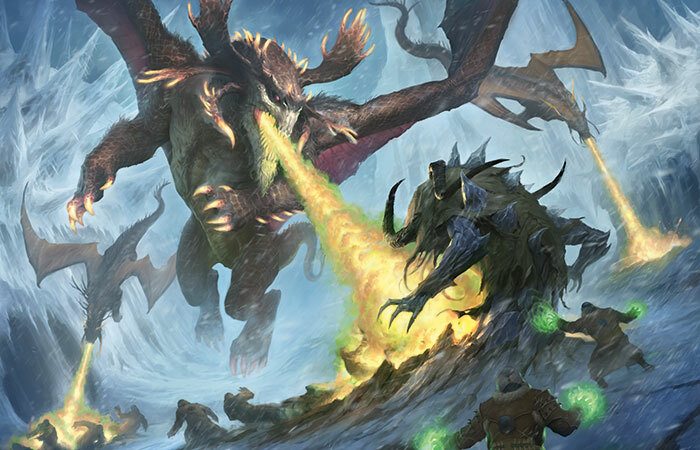 "If Ugin dies, the storms cease. The dragons fall." Ugin and the storms, connected! No wonder he had been greeted, on his arrival, by one of those tempests. Ugin was not yet a whisper, and could not or would not speak to him as he had. But he had sent a storm to guide Sarkhan. To guide him…to Yasova? "Where did you hear that?" he asked, heart racing. "In a vision of my own," she said, but she would not be deterred. "Tell me of this unwritten now. Tell me of its people. It must be glorious." He recognized, now, the gleam in her eye. It was greed, the same greed he had seen in the eye of every khan he had ever met. 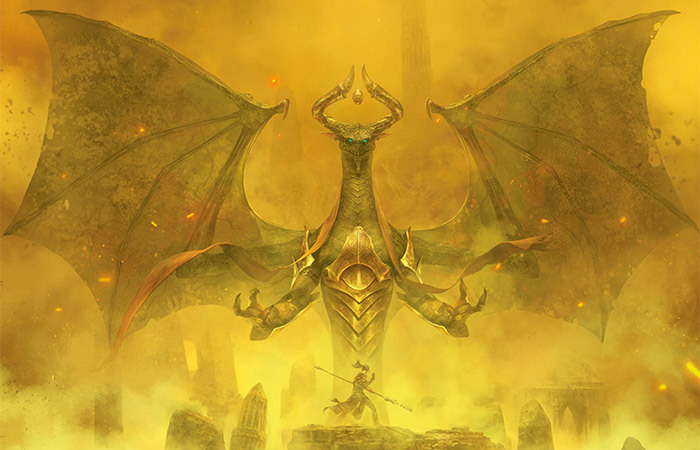 Zurgo sought blood and vengeance, Bolas sought power beyond imagining, even gentle Narset sought knowledge above all else…and Yasova, his spirit guide, sought the end of all dragons. "No, my khan," he said hurriedly. "The people, the khans, of my now…they are not like you. They are weak, foolish, grasping at the shadows of the past. They no longer have to fight for their lives, so they fight for glory or greed or nothing at all. "They are not like you," he said again, pleading. "You are better." She thrust her staff at him. A wall of heat hit him, the claw dangerously close, and he staggered back, lost his balance, and fell. He sprawled across the mark she had made in the bare rock, the gouges in the stone still uncomfortably warm through his furs. "Better," she spat. "We watch helplessly as our homes are ravaged and our children killed. We glance to the skies like frightened rabbits, dedicate our lives to nothing more than survival, scratch out a living as simpering peasants in someone else's domain." She stood over him, eyes filled with fury, holding a claw torn from a dragon, glowing with the fire of her magic and the heat of her rage. "And for this you call us better?" "Please," he said. "I have seen the unwritten—"
"I don't know what you are," she said. "I don't know how you came here, or what any of this means. But I've seen the unwritten myself, seen a world with no dragons. And it was paradise." "I have played your spirit guide," he said. "I have told you, as true as I know it, what I have seen. Please, I beg you, do the same for me. Tell me of the vision that guides you." "I saw fields choked with dragon bones," she said, eyes distant. "Skies clear of those cursed tempests. There was no more fighting. No more war. 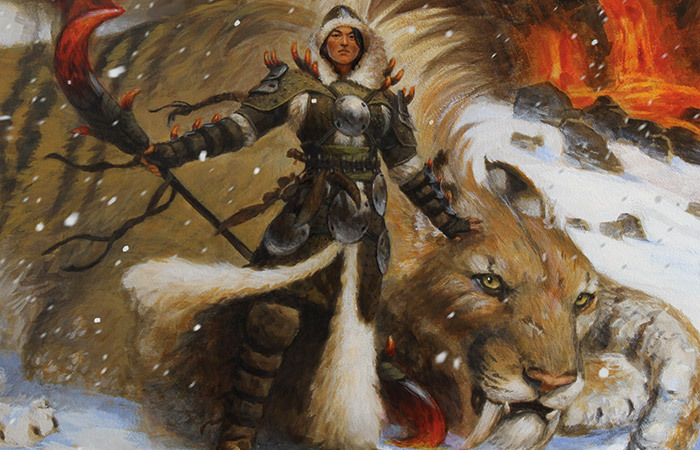 The Temur had been freed to conquer, and my descendant, a daughter many times removed, was sar-khan, lord of all Tarkir. The people lived off the land, hunting and herding, with enough for everyone and to spare. And I heard a voice, smooth and quiet, telling me how I might bring it about." "That is not how it happens," he said. Confusion reigned. "There is no sar-khan. There is no peace. Ugin showed you these things?" "No," she said, "although he spoke of Ugin. He told me to chart the storms, to track them, to leave a trail." She gestured to the scratched stone beneath him. 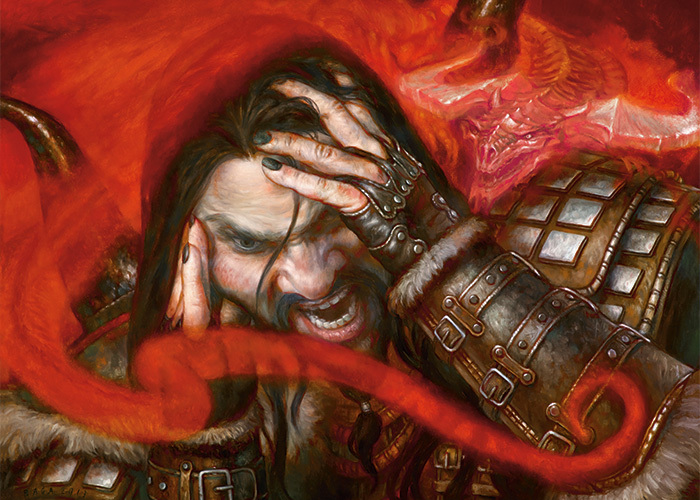 "He told me that if I showed him the way to the spirit dragon's lair…he would kill Ugin." Bile rose in Sarkhan's throat. "Who?" he whispered. "Who spoke to you?" "A great dragon," she said, her tone filled only with awe. "The greatest, as unlike them as a khan is to a packbeast. He spoke, in true words, not dragon's howlings, and he towered above me, bigger than Atarka herself, with scales like burnished gold. Above his head, between his horns, floated an egg, and in my fever-dream I thought it might crack and hatch the world anew." Curved horns, like the double curves of Yasova's marks. He should have seen it. But how could he have known? Bolas had followed him. No—impossible. Fool. Bolas was already here! What had the dragon said? I know where Ugin lays. I put him there myself, not so long ago. Not so long. Damn him! 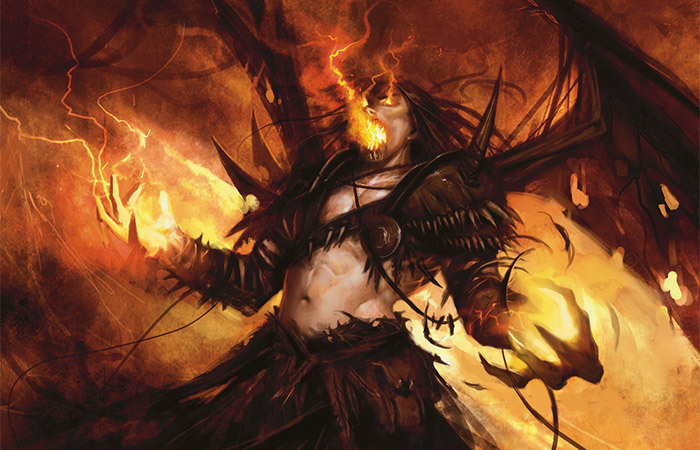 What was a hundred years to a creature such as Bolas, or a thousand, or ten thousand? Fire rushed through him. It burned his pink, soft flesh away and stole his voice, forcing out a roar that shook the snow from the trees. Now it was Yasova who fell backward, shrinking before him. His jaws burned and stretched, and he opened his mouth, breathing in a lungful of cold mountain air, ready to breathe out a gout of pure, glorious flame. But Yasova was no morsel, much as she looked like one. Her cat backed away from him, hissing, but she sprang to her feet. Her staff glowed as she drew it back, and he thought back dimly, in dragon-mind, to the claw of flame that had arced through the sky and killed one of the dragon broodlings before his eyes. Ugin was in danger. Bolas was here, now, or would be soon. He could not risk injury fighting this little creature. Not when he was so, so close. Flame spilled from his mouth as he exhaled, but it was no jet of fire. She tumbled back, singed but no doubt still alive. With a kick from his powerful legs, Sarkhan Vol launched himself into the sky.